much good it’s going to achieve. 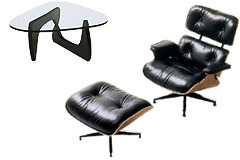 and the Eames lounge chair and ottoman of 1956.
features are ultimately secondary to the conceptual beauty of the piece’s design. among Noguchi tables made by all manner of artisans and cheap importers? to make the design world any more innovative. knock-off is that the former is "authorized" and a lot more expensive. on one of his own, to enact some kind of censorship on the Rocky Mountain News. people in Denver alone, copies can be found on the internet quite easily. from LVMH, Burberry or Dooney and Bourke by then." Does the Rocky Mountain News piece constitute irresponsible journalism? Perhaps. started running ads down the right-hand side. make the site look more professional. I don’t suppose there’s any chance that’s the case. Those google ads are now so ubiquitous I didn’t even notice them until you mentioned it in your text. I signed up myself, but never got round to placing them on my site. For this reason: Would you pay blogger for the premium service where they take the ad off the top of your blog, so that it doesn’t interfere with your pristine design? In my case the answer is yes. At the moment. Well, yes, but the great thing about Google ads is that they’re not big, nasty, flashy interfering things running across the top of the page. You get to choose how many ads you run, what colours you use, where on the page they’re placed — everything. Plus, they’re interestingly context-dependent: since I’m naturally interested in the things I write about, I’ve found a lot of the ads on my site to be actually potentially useful to me! Great post, Felix, especially the bits about fashion and design knockoffs. The ability for a creator of intellectual property to earn a living from it was important to several artists and dealers I spoke with for my NYT article a couple of weeks ago on video art bootlegging. Endlessly duplicating a tape that an artist otherwise sells for tens of thousands of dollars may help him get his work out there, but it also may inhibit his ability to sell future work at the prices he needs to recoup his production costs (and, of course, live). I went into my story with a childlike mischeviousness about letting on where bootleg video art can be found, and came away with a grudging respect for a system that actually facilitates experimental artistic production somehow. Everyone should be sporting a fake Vuitton bag, though. That sh*t’s just ridiculous. I feel that all the icons of especially classic designs belong to the people and therefore free to be reproduced at any time at any place, so these items become affordable to anybody and not an elitist object…I think that companies like Knoll and Vittra are forgotten where these icons stood for, furniture made of industrial materials cheap and available to anyone, I’ll think that is what the Bauhaus, the Stijl and all these movements wher working on in these days. I’m not paying $1000+ for a noguchi table! Forget that…Herman should stop being such a snooty elitist!